Driving a school bus full of kids and/or a truck full of flammable liquid should be challenge enough for anyone. But some drivers with commercial licenses apparently like to take risks with their lives and the lives of others. How else can you explain the fact that they drive with enough alcohol in their bloodstream to be liable for arrest for DUI in Los Angeles? 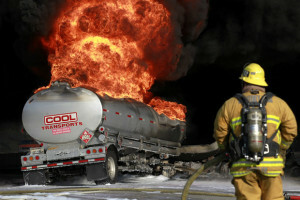 The California Highway Patrol calls the arrest of 46-year-old Charles Foster a “disaster averted.” Foster was behind the wheel of a truck pulling two tankers of gasoline on Highway 101 near the Citrus Fair ramp when the CHP responded to calls from motorists concerned about the way his truck was veering from lane to lane. When Officer Mike Phennicie caught up with Foster and signaled him to stop, the trucker pulled his vehicle onto the sidewalk instead of the shoulder of the road. After observing the trucker and talking with him, Officer Phennicie determined that Foster was operating the vehicle under the combined influence of methamphetamine, prescription pain killers and a muscle relaxer. Imagine the damage that the 8,500 gallons of gasoline could have done if Foster had hit another vehicle or run into some structure! The previous week, CHP officers in NAPA arrested 24-year-old Jaquida Parker on charges of DUI. She was operating a school bus with 28 kids on board at the time. Fortunately for the school children, Parker had gotten the bus stuck when she attempted a U-turn on a dirt road. When police arrived on the scene, they noticed Parker showed signs of intoxication. They gave her a field sobriety test, which she allegedly failed. Parker now faces charges of DUI and 28 counts of felony child endangerment. California Vehicle Code 23152(d) sets some very restrictive standards when it comes to commercial drivers and DUI. Unlike regular driver’s license holders, commercial drivers can’t have a blood alcohol content higher than 0.04 or above when they’re operating a vehicle. (The limit for everyone else is 0.08.) Commercial drivers convicted of DUI also face losing their livelihood; under Vehicle Code 23152(a), the state suspends their commercial driver’s license for a year.